After Frederick II completed his conquest of Sicily by pacifying the interior of the island, he re-settled tens of thousands of Muslims who had been holding out there to Lucera, Apulia, where he also established an imperial court. Frederick employed women, guarded by eunuchs, to make textiles and weapons–his enemies spread rumors that they were his harem. He also established a musical corps of young Black men and selected an elite force of Saracen warriors to serve as his bodyguards. Through education and training, Frederick provided varied opportunities for talented individuals to advance in his service, regardless of religion or social origins. As the account below tells us, one of these individuals, named Johannes and called “the moor,” rose from the lowest ranks of society. He was born a slave but was trained in Frederick’s service and rose to become his personal chamberlain. Frederick eventually appointed him his chief administrator in Lucera, and in this position Johannes became very influential throughout southern Italy, taking on the role of chancellor after Frederick’s death. Johannes met an unhappy end, though. As the representative of the Hohenstaufens, he had long been embroiled in conflicts with the Pope, but in 1254 he fatefully decided to switch sides and was murdered by disaffected Muslims loyal to the dynasty. However, the aforementioned Ioannes Morus was a certain black slave from the house of the Emperor, who – as he seemed hardworking from childhood and diligently carried out his orders – grew to great rank in the court of the Emperor, that the Emperor himself made Ioannes Morus the custodian of his treasury, a part of the inner circle of his court, and placed him in charge of his own men, even though he looked deformed and was the son of a servant-girl. After all, the Emperor did not value each man’s origin more than his virtues and habits, for the nobility that is derived from good conduct seemed more illustrious to him than that which is derived from blood. After the Emperor had died, Prince Manfredo occupied himself with the tutelage of his brother. In this capacity, he appointed Ioannes Morus – who was unwilling – as the master and governor of the imperial treasury; indeed Ioannes was so greatly promoted by the King that he was even placed in charge of the city of Lucera, and the king made sure that Ioannes was called the governor of that city. Indeed, in Lucera, even while the king was alive, Ioannes had greater power than the king himself, who did not do as much for the Saracens of that city as Ioannes did, who remained as the governor – and almost the master – of Lucera. After the aforementioned event of Burelli’s death, the Prince, while he was at Acerra, sent his messengers to Ioannes, to whom he had been in the habit of entrusting the growth of the imperial treasury, and told him about Burelli’s death so as to ask for his help in that time of difficulty. Ioannes praised the Prince’s prudence in the aforementioned event, and, with profound feeling, promised to help him. Nevertheless, as soon became clear, Ioannes had a different plan in his heart than that which he expressed in words. Indeed, the amount of trouble that the Prince suffered by leaving Acerra and the extent to which Ioannes Morus let him down must be made clear. The Prince left Acerra before midnight, upon the exhortation of his relative, the Count of Acerra, and proceeded to a castle called Miagliano. Meanwhile, Ioannes Morus, who, as previously stated, had promised that he would proffer both help and advice to the Prince, set up one of his followers by the name of Marchisio to govern the city of Lucera in his place. He then procured for himself a thousand armed Saracens, both cavalry and infantry, and three hundred Teutonic knights located opposite to Lucera in the imperial residences found there. These knights had been placed in the city of Troia after the death of the Emperor, and had been expelled from the city by its inhabitants after the death of the King. They were received under oath by Marchisio, and given strict orders to allow nobody, even the Prince himself or any other person belonging to the city, to enter Lucera. Then Ioannes set off to the Pope, telling the Prince that he was leaving to conduct useful business for the prince with the Pope, but in fact intending to place both himself and the city of Lucera in the power of the Pope, thereby creating as much difficulty for the prince as possible. However, when the Prince heard of Ioannes’ departure from Lucera, he sent many messengers to get a feel for the city; these messengers were familiar and friendly with the Saracens of the city, and were able to enter and leave the city without suspicion. They did so in order to discover how the city felt towards receiving the Prince. Through his messengers, the Prince discovered that the people of the city were rather well-disposed towards him, and that they wondered why he had not arrived at the city directly, since they were all ready to give themselves and their possessions for the defense and honour of the Prince. In the aforementioned royal palace at Lucera were found the treasuries of the Emperor Frederick, King Conrad, Marquess Oddone, and Ioannes Morus. Gold, silver, clothing, precious stones, and a great number of weapons were discovered in these treasuries. The Prince therefore began to distribute these treasures and goods, which had been found in the treasuries, among the soldiers; in doing so, he gave salaries both to those who had come with him from Capua, and to those who had come from all other regions. The aforementioned Teutonic knights, who had been posted to the aforementioned residences by Ioannes Morus (as it is said), immediately presented themselves for service to the Prince after his arrival at Lucera. The Prince received them gladly, and gave them a salary. Many other Teutonic knights, who had been scattered in various parts of the kingdom and especially in Apulia after the death of the King, also came to the Prince after hearing of his arrival in Lucera; these were also received and given salaries. As some of them did not have horses or weapons, the Prince himself provided horses and weapons to them, according to what each man lacked. Meanwhile, however, Ioannes Morus was in Acerenza. While the Prince entered Lucera, as previously mentioned, Ioannes Morus was returning from the papal court; upon hearing that the Prince was at Lucera, he was extremely distressed, and marvelled at how the Prince had been able to enter the city, when he himself had most diligently seen to it, before his departure, that the city was guarded. He sent messengers to the Prince as a supplicant, pointing out that he had sent a letter of security to the Prince, before whom he wished to prostrate himself. However, the Prince detested the disloyalty and treason that Ioannes Morus had displayed, and rejected his letter; moreover, he said that if Ioannes should come before him, he would be received according to his worth. When Ioannes had heard this, he did not come to the Prince at Lucera, demonstrating that he had a wounded conscience, but indeed took a straight course to Acerenza, where, as it is said, he stayed for some time. However, the Saracens who were staying there with him discovered his treason, and rushed upon him with a bestial rather than a human instinct. Having killed him, they divided his body limb by limb. His head was brought to Lucera, and hung at the Fogitana gate as a visual example of his unspeakable treason. The Saracens also sent messengers to Galvano Lancia, the uncle of the Prince, who was returning from the Roman court; at the time, he was in his castle called ‘Tulle’. The Saracens told him of Ioannes’ death, and besought him that he should come to Acerenza, and take that territory on behalf of the Prince. Source: Nicholai de Jamsilla, “Historia,” ed. Lodovico Antonio Muratori, Rerum italicarum scriptores, Vol. VIII, trans. Astrid Khoon (Milan, 1726), 522 B, 527 D, 533 D, 542. 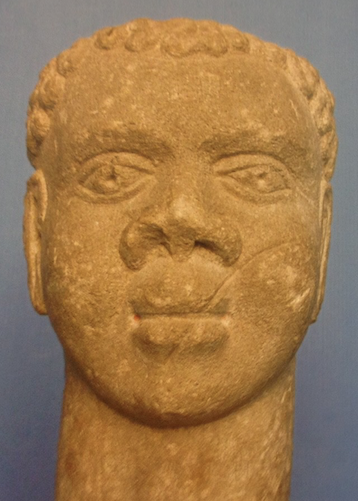 Image Source: Head of a Black African (ca. 1240s), Museo Civico di Lucera Giuseppe Fiorelli. Johannes dictus Morus (d. 1254) by Jeff Bowersox and Astrid Khoo is licensed under a Creative Commons Attribution-ShareAlike 4.0 International License.